This resort features 4 restaurants, a casino, and an outdoor pool. Free WiFi in public areas and free valet parking are also provided. Additionally, a nightclub, 5 bars/lounges, and a 24-hour fitness center are onsite. 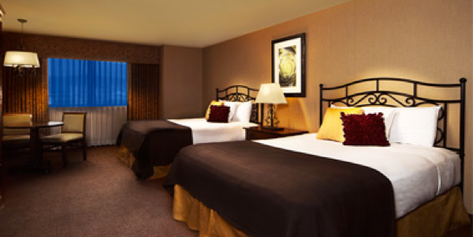 All 200 rooms boast deep soaking tubs and offer free WiFi and flat-screen TVs. Other amenities available to guests include free wired Internet, satellite TV, and coffee makers. The warm, traditional rooms are equipped with WiFi and TVs with pay-per-view channels. In addition to the casino, amenities include a showroom and dance hall with live entertainment, a movie theater, a bowling alley, an arcade, and an indoor play area with childcare services. There's also a pool, plus several restaurants serving seafood, steak, and Mexican dishes.